Caption slip reads: "Photographer: Glickman. Date: 1951-10-02. Reporter: Glickman. Assignment: Traffic, San Fernando. One overall view of two trucks. Note bales of cotton from truck in foreground. San Fernando officers measure distances where two women were struck in crosswalk. G18-19: Dr. Frank A. Pedersen works over Miss Charlene O'Neal at San Fernando Hospital. 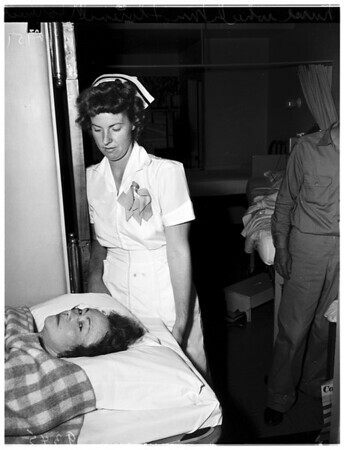 Nurse wheels Mrs. Florence McCormick out of X-Ray".